Thank you to Fulcrum Properties Group for sharing this great information with our readers. A version of this post appeared on their blog. Hurricane Florence as of 9/12/18. Imagery via Capital Weather Gang. 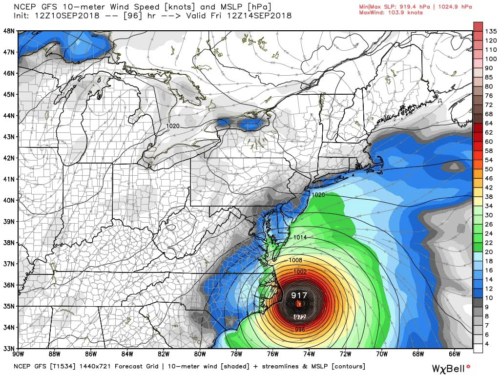 Hurricane Florence is expected to make landfall Thursday night as a Category 4 storm. Our area is expected to see high winds and a lot of rain. We’ve already seen much more rain this year than normal, which means the ground is saturated. Heavy rain from this storm will not have many places to go, creating a high risk for flooding. Wet ground also increases the chances of trees falling, creating power outages and damaging buildings and cars. Take time now to prepare your home and family for the impacts of the storm.  Clear your gutters and drains to ensure excess amounts of water have somewhere to go. valuables, or to set up barriers with sandbags to minimize damage. you have a garage door, make sure it is properly braced. consider investing in these items.  Check that your fire extinguisher is accessible.  Call your insurance company to confirm the extent of your coverage.  Duct Tape – it’s one of the handiest tools in the kit!  Use flashlights instead of candles to reduce fire risks. refrigerator will keep food cold for about 4 hours if it is unopened.  Put cell phones on low power mode to save their battery life. momentary surges or spikes that can cause damage.  Look at your roof to see if any shingles have blown off or been damaged. do so, turn off electricity at the main breaker or fuse box to prevent electric shock. downed power lines can also electrically charge the water.  Do not drive through a flooded roadway. with anything in your home.